You guys! It’s been a long time coming and I’m excited to finally share an update to our upstairs loft (featuring before & after photos). We moved in to our home 8 months ago and until now, this loft space was left completely untouched. I think I didn’t bother with it since I felt the layout was a bit awkward. It’s a long, misshaped rectangle with a window placed in the only solid corner. I was having too much fun renovating and designing other rooms in our home and this one felt like a beast. 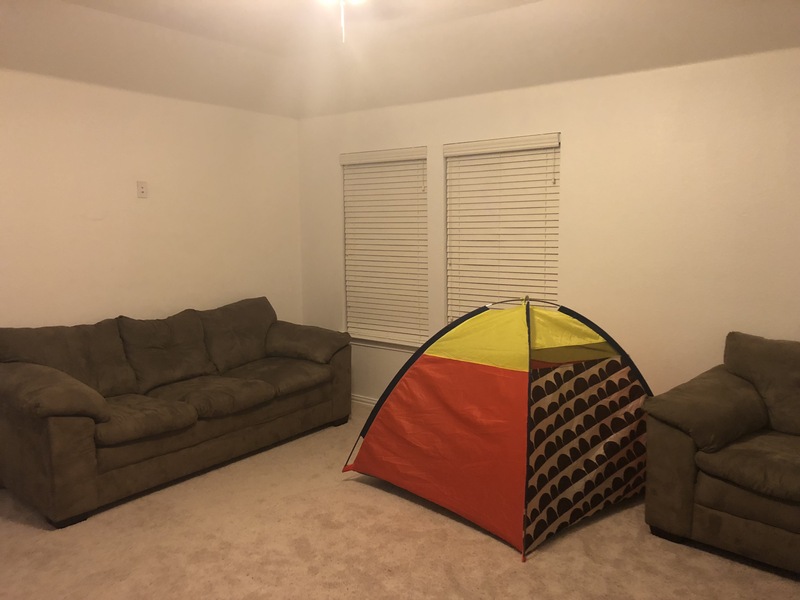 So to keep it classy in the mean time, we kept our 9 year old sofa set and a lovely, rainbow-colored tent in here as a landing that you’d see if you walked up our staircase. To be fair, it’s an upgrade of a sight from the yellow paint that was splattered across the walls. This photo below is after we painted the upstairs loft. And since I’m a sucker for a simple before & after using only products (no renovation) here’s a few pictures! I really struggled with the layout. How much seating did this area need? I considered a sectional sofa but only one corner would fit a sectional and it’s the corner with the window. I LOVE leaving windows uncovered to let natural light flood through. The sectional idea was out for the sake of highlighting my 2 small windows. I wanted to create a conversational area so that 2 seating sofas would be facing towards one another. But since the space is so small, I didn’t want to close the space even more with a larger sofa in the middle of the room. I didn’t need a lot of seating in the room anyways and so I decided to have a single chair framing the space while using a large rug to create the outline. 4 years ago, in our last home, I printed out black & white large engineer prints of each of our kids. We called them their personality photos since they were single, candid portraits. 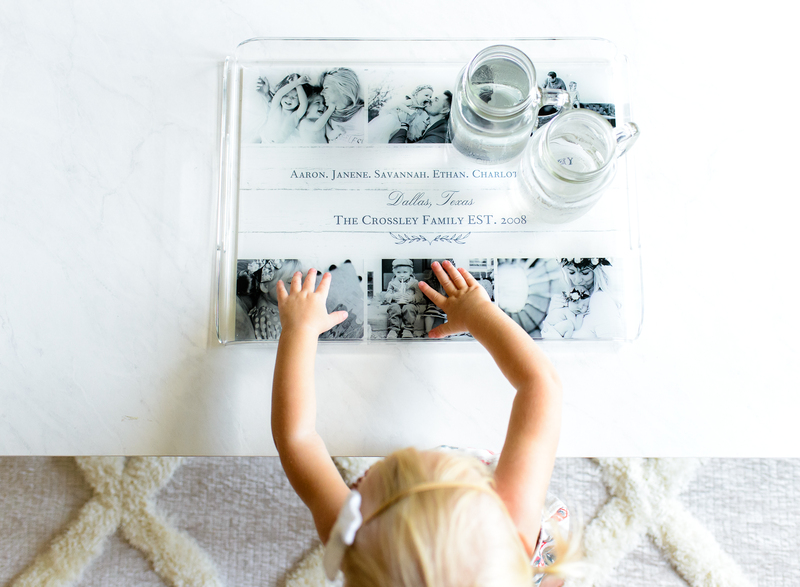 I sifted through their photo albums and picked the photo that highlighted their personality. Savannah has a joyful spirit. Ethan has a social, caring character. 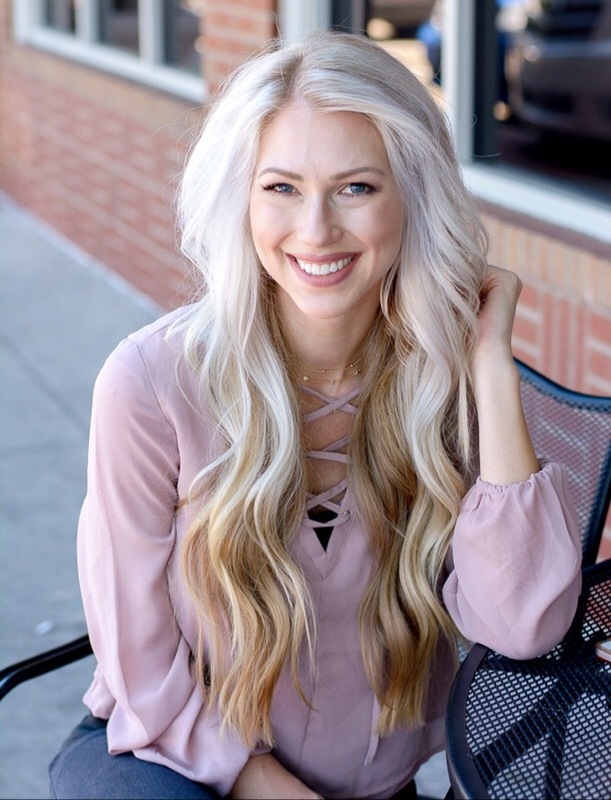 Charlotte has a sweet, shy personality. I glued the prints to a thin piece of plywood, painted the sides and drilled them into the wall. I hung a darling sign above them that read ” Never Grow Up”. It was in our upstairs loft and was my favorite spot! 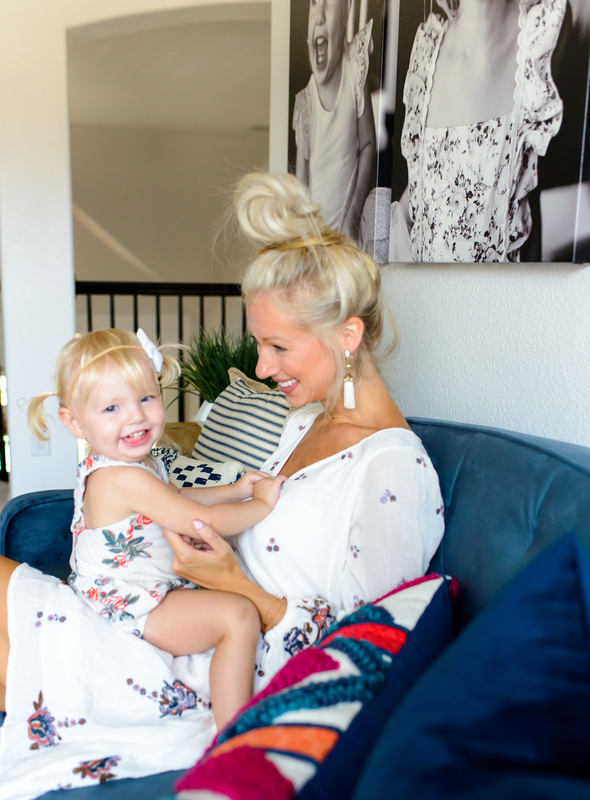 In this home, I knew I wanted to do the same thing except with adding our 4th babe, Avery. Instead of sifting through old photos, we did a 5 minute photoshoot and snapped all 4 photos in our dining room. They took turns sitting on the table facing the window, with no lights on in the background to get the look we wanted. I tried shooting in front of a white background, which is much more popular, but I loved this black background effect so much better! It’s bold and really makes the focus the joy in their faces. I did the same jokes & tickles with each of them and Aaron snapped their reaction on our camera. Every single one of these photos melt me. Sometimes it sure feels more fun to be back on the other side of the camera (wink wink). Since I want these 4 meaningful photos to look super beautiful, professional, and to last, I ordered and had these printed on A LARGE CANVAS IN BLACK & WHITE. Easy peasy! I even did it straight from my phone! They were, crisp, clear, and maintained every detail we caught through the lens. They look incredible. I ordered the 24″ x 36″. 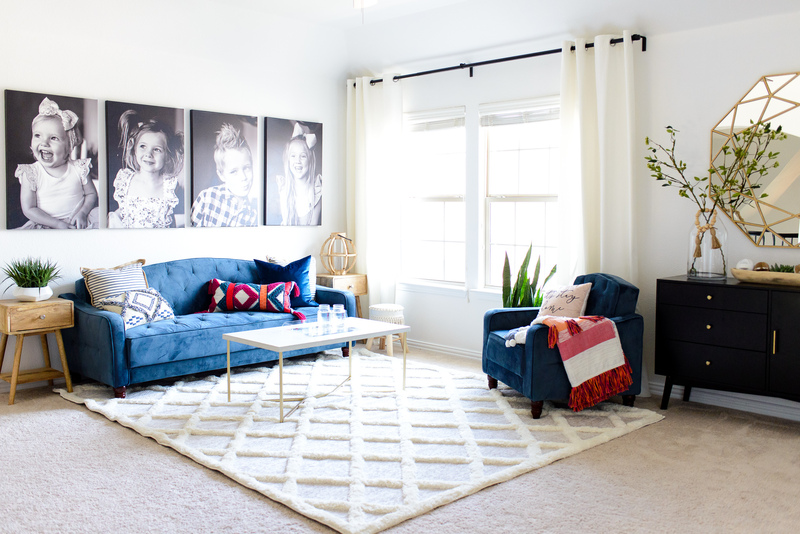 They’re certainly a large statement piece and I’m so glad I went big! 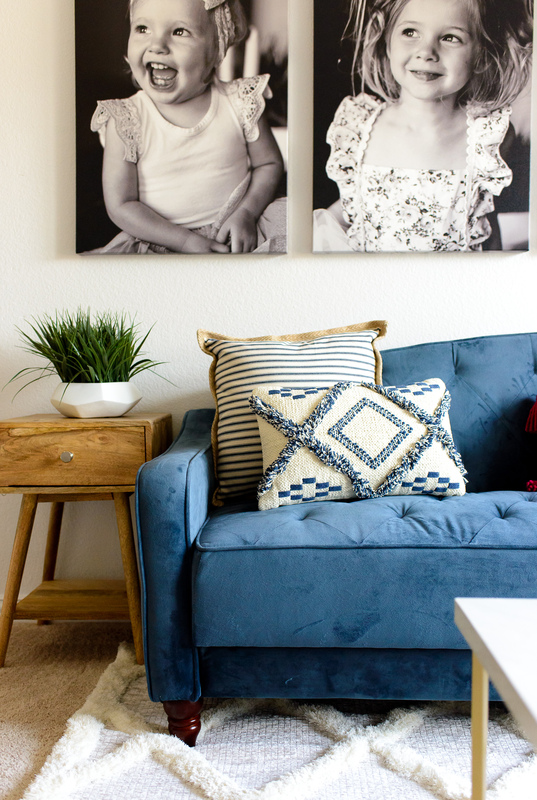 I hung these about 7″ from the top of my couch, spaced a few inches apart from one another. Avery’s darling grin just KILLS me!!! Her stretched out legs and squinted little eyes are about the cutest thing I’ve ever seen. 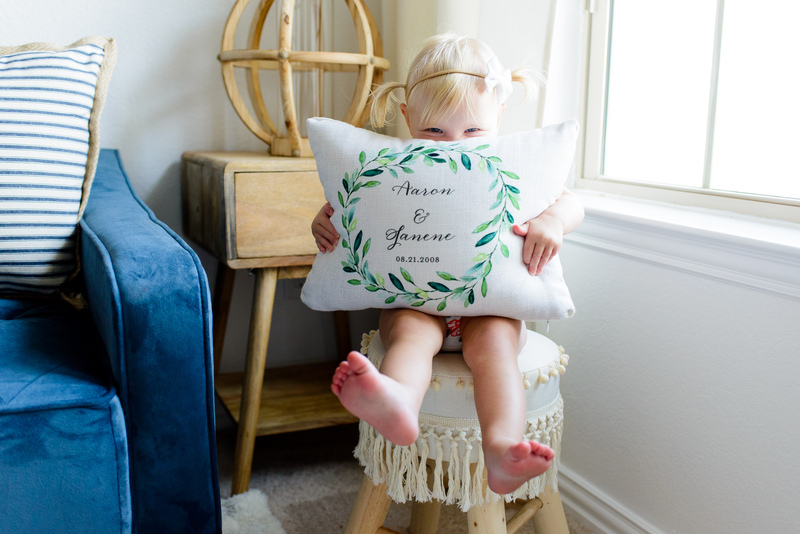 And her clutching this pretty FOLIAGE CIRCLE PILLOW is even more sweet. I love the dainty leaves in this painted halo and wanted to personalize it with our names and our wedding day, 08-21-08. 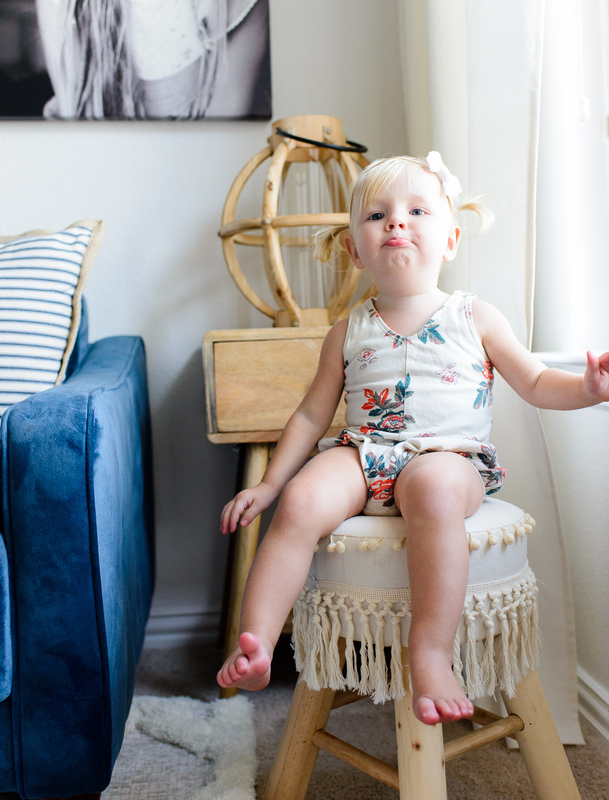 Baby Avery is our little one with many personalities. 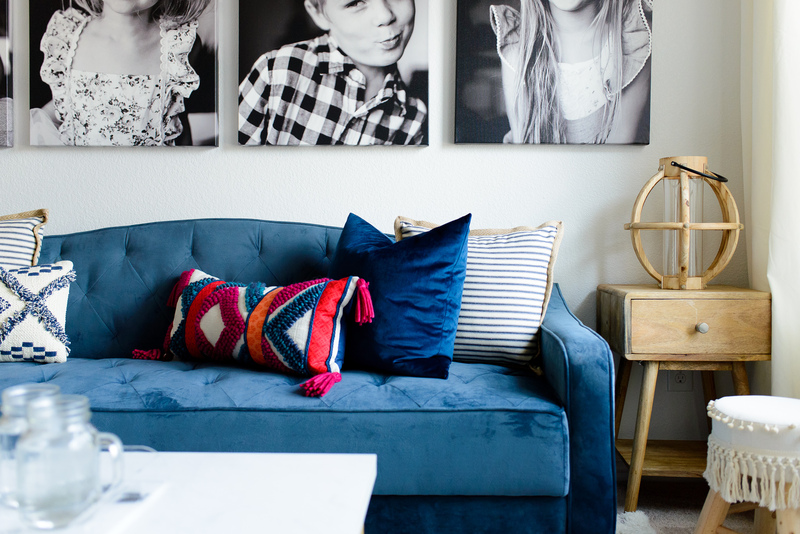 I’m obsessing with this BLUE VELVET TUFTED SOFA & CHAIR. It was a no-brainer for me to go with this color that I’ve been adoring for so long! 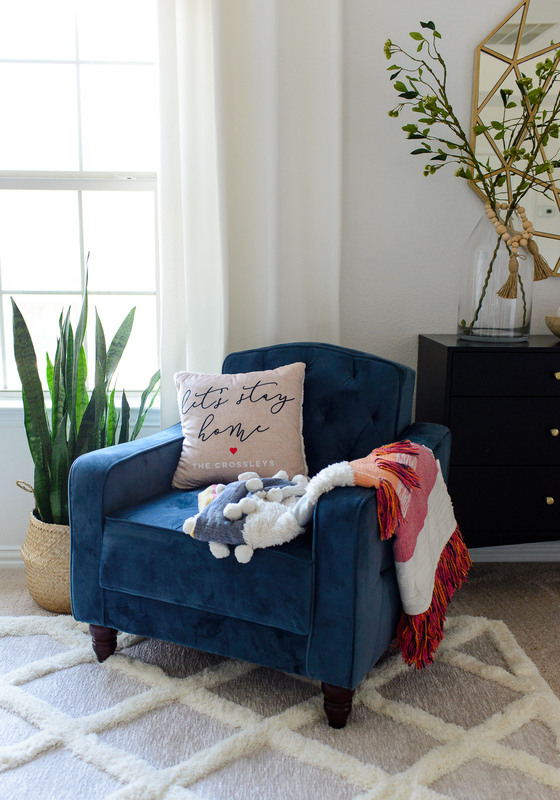 I’m actually super temped to add this color to our bedroom.. Anyways, if you’ve been looking for a blue velvet couch or accent chair then these are worth the splurge since they’re the most affordable ones I could find! Such a steal! You won’t be disappointed. THIS DARLING COLORFUL THROW BLANKET has been one of my most favorite finds! 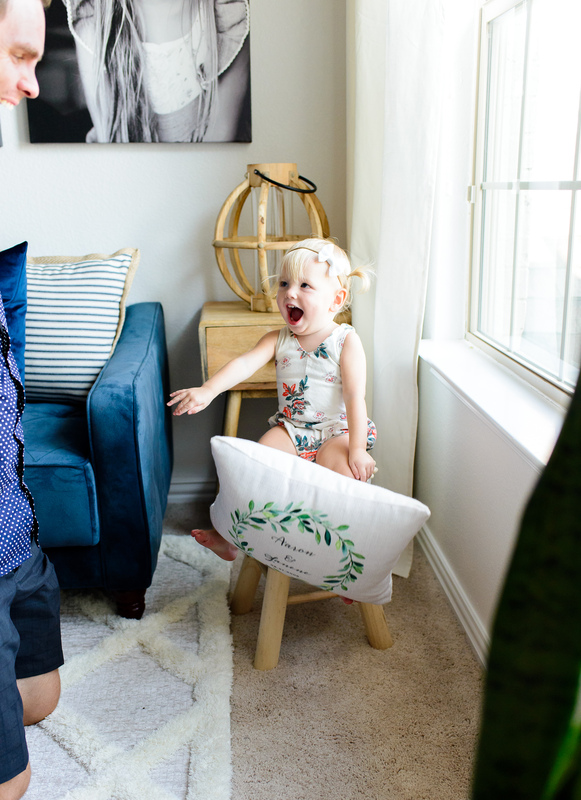 And when I saw this “Let’s Stay Home” PILLOW from Shutterfly, I was hooked! I’ve always loved this phrase, and seeing that I could add a touch of personalization was an adorable feature! I added our family name THE CROSSLEYS underneath the charming phrase. I love the calm, script font! And you GUYS! 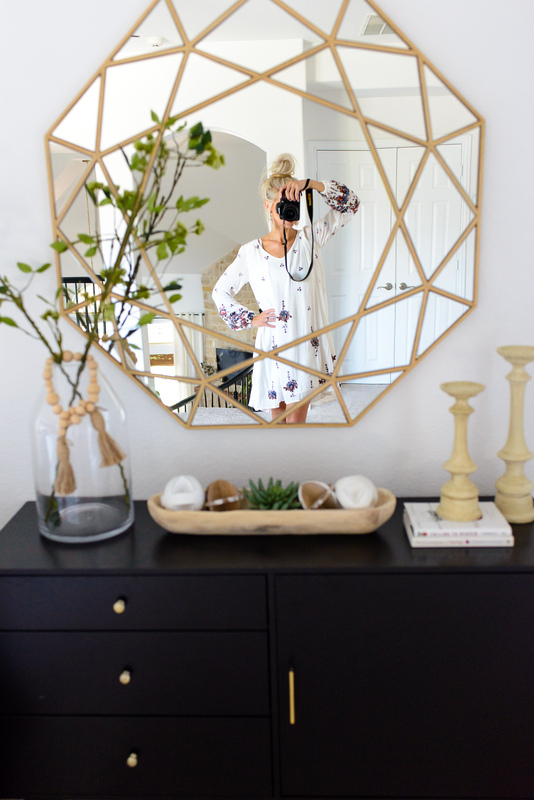 I’ve been eyeing THIS MIRROR for along time and finally took the plunge! It’s when art and functionality become one. 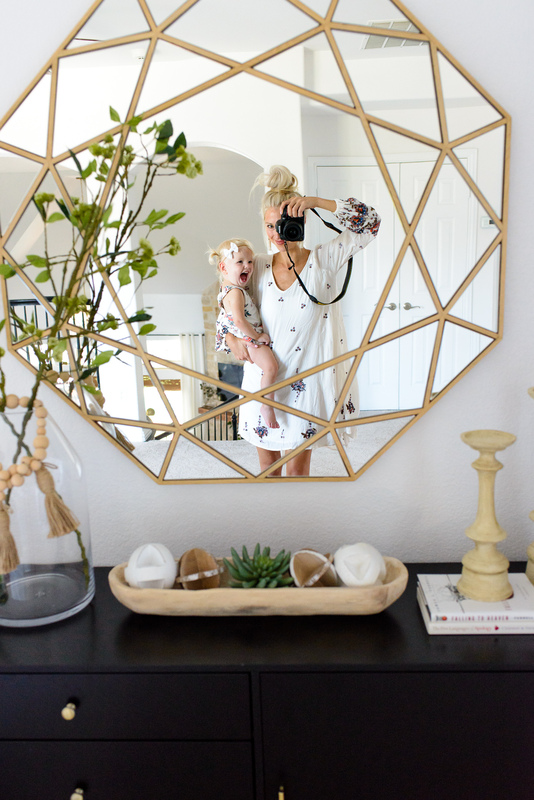 I always love a good mirror over a console table and the contrast between this BLACK MID-CENTURY CONSOLE TABLE plus this wooden gold-brushed mirror is too perfect! 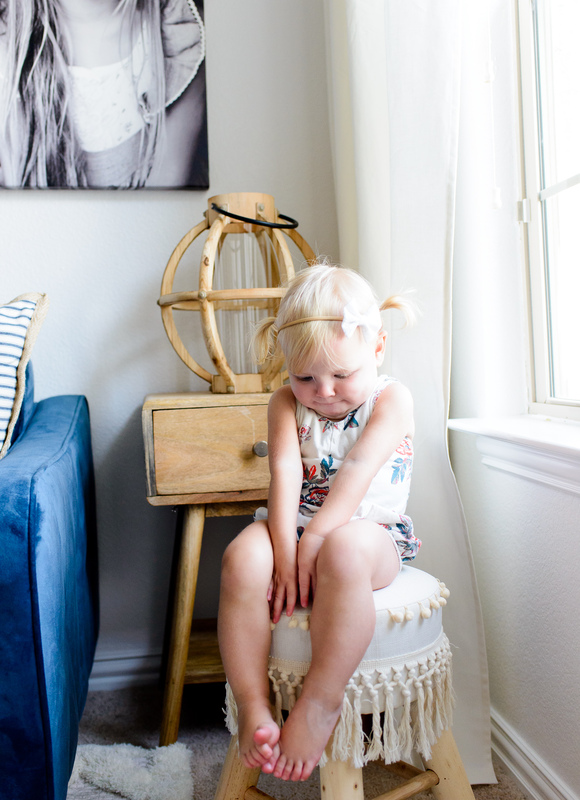 This room is kid-friendly and I need for Avery to be able to wander and explore without the fear of getting hurt. So, I chose to keep this COFFEE TABLE simple and clean with 1 darling SERVING TRAY. 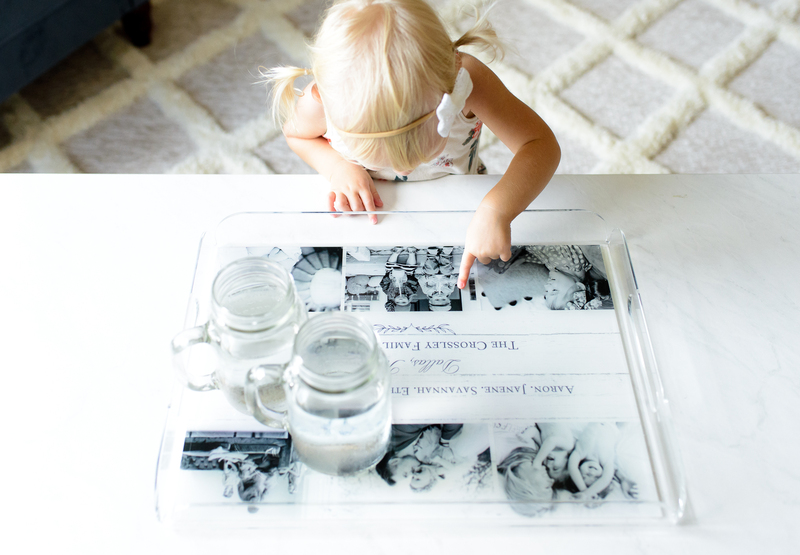 Instead of using photo frames that could get broken if they were thrown off the table by tiny hands, I used this durable and waterproof tray, customizing it with some of my favorite family photos. I always spot Avery over there pointing out her beloved fans. It can double as a serving tray for snacks and food or as a supply holder with a few books, candles, or a vase holding a small bouquet of flowers. Here, I styled 2 MASON JARS. These jars are extra sweet since they have “Aaron <3 Janene” monogrammed on to them. 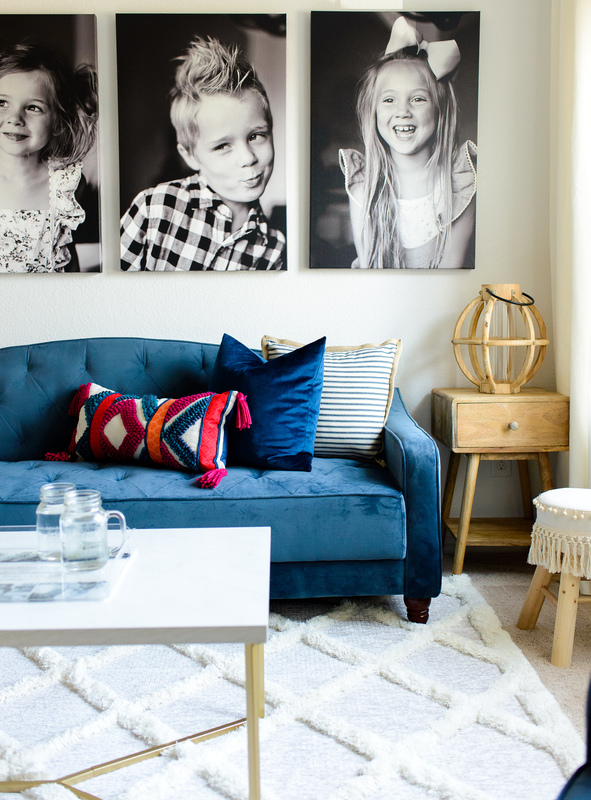 Such fun and easy ways to personalize a space! Next Post My Favorite Fast Snacks + Giveaway! Your children are definitely delightful! The rug ties in that space perfectly! Hi Janene ! Just love your style and inspiration ! But most of all I love the dress you’re wearing . Could you let me know where you got it ? where are the side table, little fringe stool, and rug from? Love the room!! 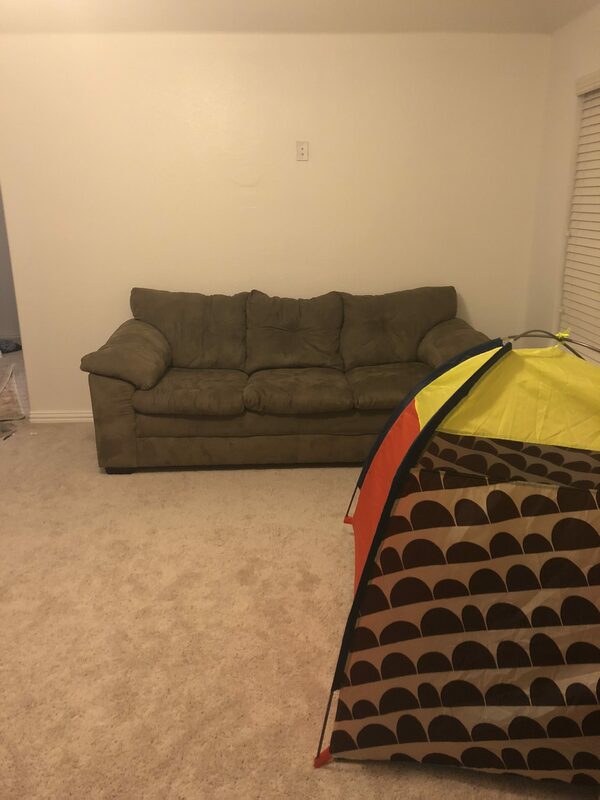 Where are the couch pillows and throw from? Beautiful room! Could you please share the wall color? Thank you! It’s “Nano White” by Behr. I did Satin (eggshell) for the sheen. I love how you do before and after pics! 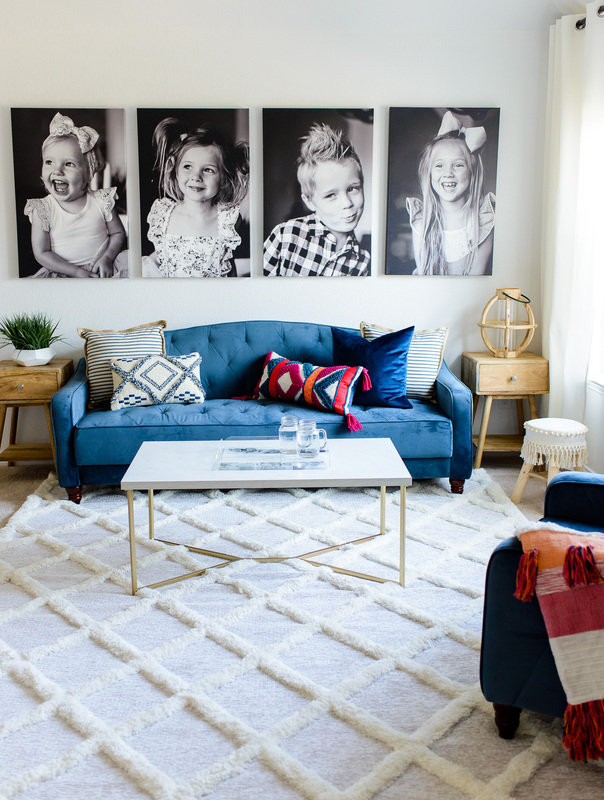 What a beautiful space you have created and the pics of your babies are just adorable!! Oh WOW! Thats such a huge difference!! It looks AMAZING and so beautiful!! I absolutely LOVE the big pictures of your children hung up like that! So cute. it looks great. You made great use of the space and there is tons of light, despite the one window. Thank goodness you didn’t block it with that sectional. Great job! Your Loft looks amazing! 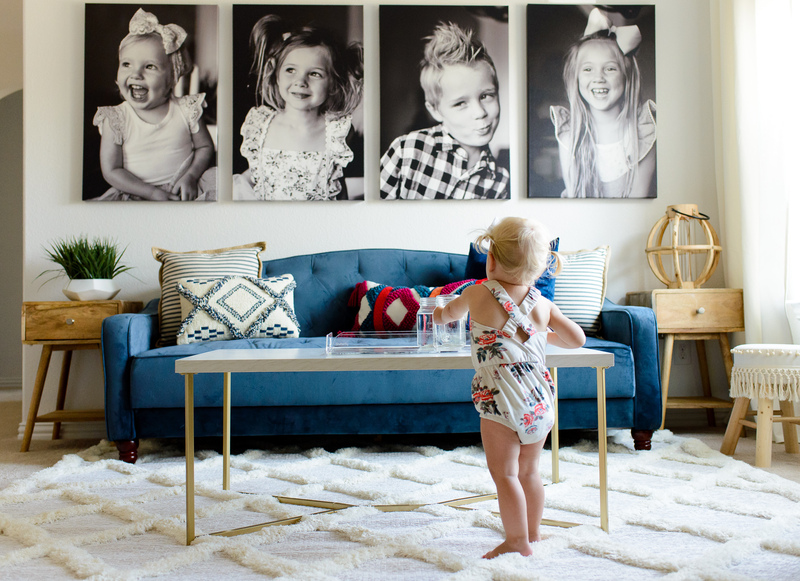 I love how you decorated the walls with black and white portraits of your kids. That mirror’s so gorgeous and exactly what I’m looking for. Your loft looks so clean but fun at the same time I love it. You and your baby look adorable!! Also, love your decor! Hi! I absolutely love your layout and have been looking for something that can work with my corner fireplace- thank you! I was wondering if you could give some details about your drapes/curtains + rod? Where is the rug from?! I love it! I included a link at the bottom of the post to almost everything in the room! Hi! I was wondering where are your curtains from?? Ikea! I’ve put them on a lot of our windows and have been super happy so far!